in our retail-obsessed society, cashiers are the gatekeepers for all of that activity. to be a cashier, you need a range of solid skills: handling money, handling people, troubleshooting tech or people issues on the fly, being a good ambassador for the store, etc. it’s a lot—and if you’re updating your resume, it’s important to make those skills shine. 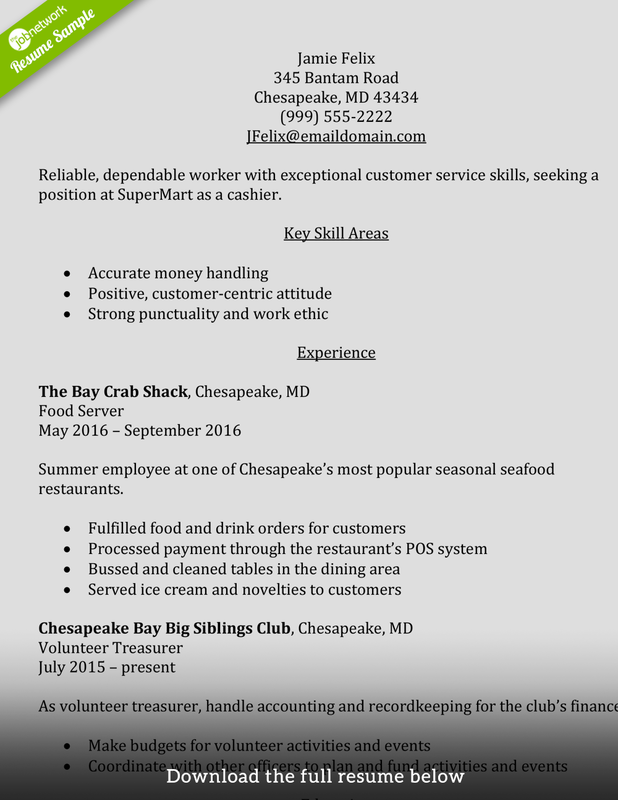 let’s look at the cashier resumes of three different cashiers: one entry-level, one restaurant cashier, and one retail cashier. first up is jamie, who is just out of school, and is looking for a cashier position as a way to build retail experience. jamie just graduated from high school, and so doesn’t have a ton of experience yet. however, lack of experience should never stop you from writing a full resume. instead, it’s about shining up the experience you do have, and making sure it emphasizes the skills you’ll need for the job you’re applying for. in jamie’s case, that means playing up his summer experience working in food service. it may not be a one-to-one match with the retail cashier job he’s hoping to get, but it demonstrates that he has a baseline of customer service and money handling skills. the bullets don’t need to list everything you did at your previous job—just the parts that will translate the best for your new, hoped-for job. jamie also includes his volunteer experience as a treasurer, because it shows two things: he is likely responsible enough to be trusted with money, and he has experience being accountable with a bottom line. that’s a very important skill to show in your resume, even if you don’t have a lot of cashier-ing experience under your belt yet. next up is joann, who is a more experienced restaurant cashier. joann has a lot of experience in her field, but she wants to set up a specific narrative with her resume: that she’s great with customer service and problem solving, and brings a professional approach to her job. so she uses a summary statement, rather than an objective, to set up that theme. that way, when she launches into her work experience, the reader knows what kind of information to expect. it also helps her refine her experience—she doesn’t need to list every customer she’s helped, or every small task she handles as part of her busy day. rather, she focuses on bigger themes of customer service and handling the ins and outs of restaurant transactions with her bullets. 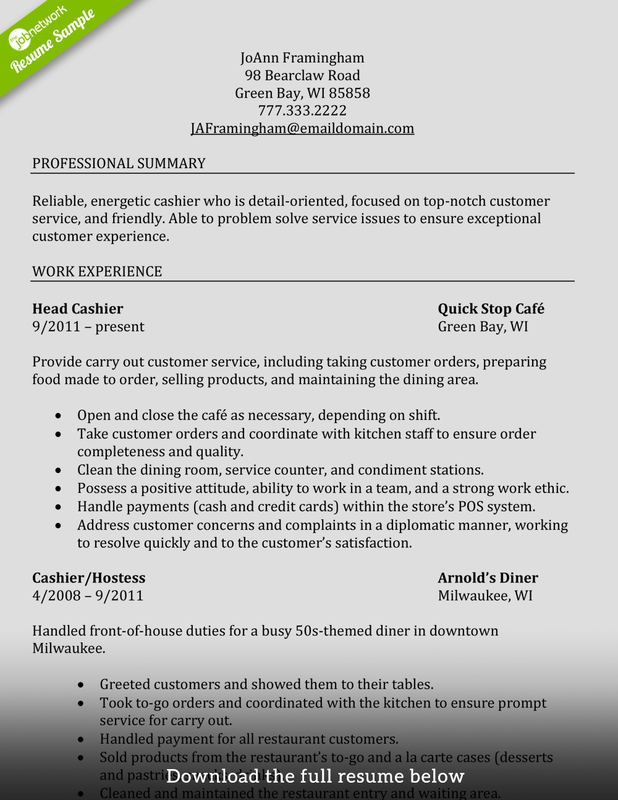 as she starts to close out her resume, she revisits those ideas with a quick summary in the skills section, reminding the reader about her strong points as a restaurant cashier. next, we have penny, who is experienced on a different cashier path: retail. like joann, penny has a good deal of experience, and wants that to be her main point in the resume as she looks to advance in the retail business. penny’s resume is a solid one based on her decade-plus of experience, but it also has an eye toward what comes next for her. she’s currently a college student, studying business and accounting. this suggests that she may not want to be a cashier for the rest of her career, so what she wants to achieve here is showing her strong base of retail/business skills. her professional summary is kind of a combined objective/skills section, listing what she sees are her strongest qualities, setting the tone of the rest of her resume. rather than saying “i’m a self-starter,” penny is savvy about inserting that into her experience bullets, showing rather than telling. she mentions busting a shoplifter (and being acknowledged for it), and also her success in taking initiative to sell customers on applying for credit cards and rewards programs. it’s important not to use vague, general phrases that aren’t backed up in the rest of your resume. if you say you’re a self-starter, show how you’ve done that. if you are detail-oriented, use brief examples about how you’ve applied that in your job (like in the shoplifting bust that penny mentions. you can talk more about specific examples in your interview, but on the resume it’s important to present information that you can back up in a very specific way. so how about you? 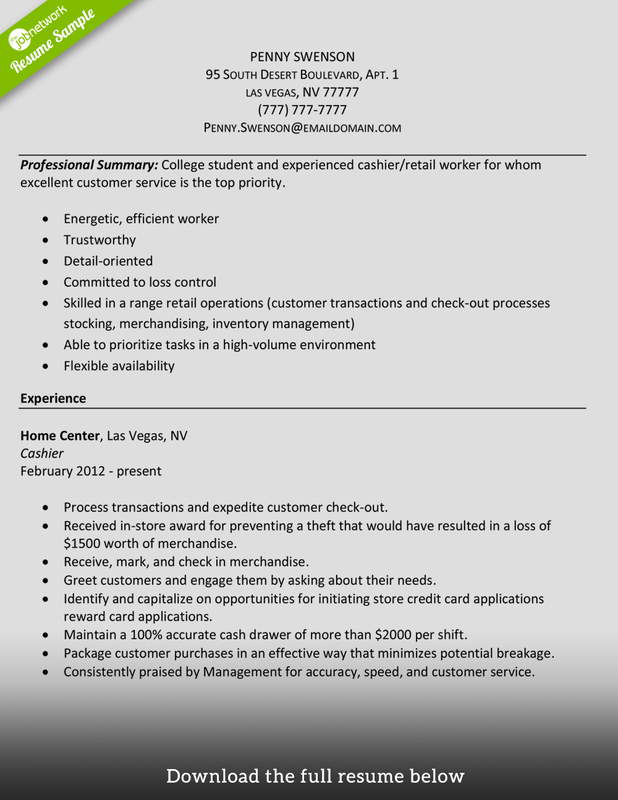 are you ready to push your career as a cashier forward with a rocking resume? thejobnetwork has listings for all levels of cashier positions around the country.